The level of speculation surrounding Zack Snyder's Batman v Superman: Dawn of Justice shot into the stratosphere over the past twelve months. From the reasonable assumption that it'd become an adaptation of one of Frank Miller's seminal graphic-novel arcs to wild theories based on throwaway clues -- question marks, scribbled notes, characters acting oddly in the trailers -- the DC fandom dreamed up tons of directions that could've been undertaken by this extension of the universe from Man of Steel and a soft reboot of the Batman mythos. Turns out, as is often the case, guesswork from fans about the story's path ended up more intriguing than what materializes in this leaden, largely joyless mess that's every bit from the same mind as that of Sucker Punch and the previous Superman installment, marred by shaky-handed writing that gives the whole shebang a strange and manufactured temperament. Explosive action and ideas about uncontrollable godly power can only go so far. Dawn of Justice picks up eighteen months after the events of Man of Steel that rocked the city of Metropolis -- and the world -- with grand-scale destruction, the aftereffects as Superman (Henry Cavill) struggled to defeat General Zod and his terraforming scheme. One of the buildings demolished during the battle belonged to the enterprises of Bruce Wayne (Ben Affleck), the identity of Gotham's vigilante crime fighter, Batman, which drew the hero toward a more substantial, universal concern than controlling the crime of his city. As Superman confronts the worship of common citizens and the scrutiny of the government, positioning him as both an almost-deity and a threat to mankind, billionaire tech-company heir Lex Luthor (Jesse Eisenberg) takes the side of caution and pushes to eliminate the superhero, hoping to secure the resources and connections of the government to fuel his research. Batman, on the other hand, works between the sides to investigate both the god-like alien and the pursuits of Luthor. This is a different iteration of the Caped Crusader than that of Christopher Nolan's Dark Knight trilogy, though Dawn of Justice offers little nudges and winks that reference the prior group of films. Bruce Wayne is older here, silver-haired and growingly cynical about the state of affairs in his city and beyond, who resorts to leaving permanent marks on his criminal victims and doesn't hold back on the violence as strictly as one might expect considering his no-kill policy. He's more of an unstable renegade in a beefier suit with similarities to the one found in Frank Miller's "The Dark Knight Returns" -- another depiction of the hero's later years -- and it's one that Ben Affleck does a surprisingly solid job of filling out. Affleck's Batman and Bruce Wayne tends to be more wrathful and tormented by his past, galvanized by the actor's mix of stoic glances and bursts of raw enthusiasm as he investigates Luthor's operation and expresses his concern for the global population. Combined with a tactical and gristly take on his butler, Alfred, from Jeremy Irons, the representation of Batman is by far the film's most intriguing element. 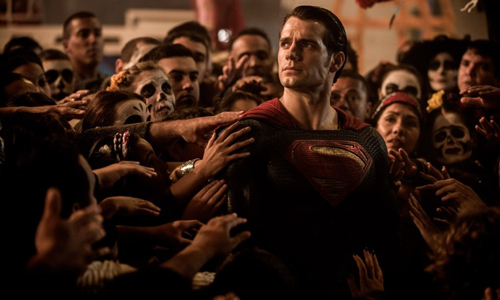 Yet, despite some of the concerns people might've had leading up to release, Dawn of Justice really does center more on Superman -- a response to the hero's presence on Earth -- and what measures should be taken to control, perhaps even eliminate, such a seemingly uncontrollable entity. Writers Chris Terrio (Argo) and David S. Goyer (Batman Begins) take a stab at a darker, more theme-heavy approach to the situation, focusing on the push-and-pull considerations with the public's reverence for Superman's heroic efforts and the inherent dangers of his superior power, which also tackles the concerns some people had over the catastrophic ending to Man of Steel. When tied to Clark Kent's relationship with daring reporter Lois Lane (Amy Adas) and the after-effects of the battle in Metropolis that killed and injured countless people, the skeleton of a compelling plot takes shape, enhanced by the threat of men with endless resources like Lex Luthor and Bruce Wayne who could comes as close to combating this "alien" as humanly possible with the right tools. There's a whole lot more going on in Dawn of Justice, though, from investigative espionage and government red-tape to the emergence of other empowered individuals in the vein of Superman, resulting in a chaotic and ludicrous connection of events just to keep things flowing from scene to scene. Tethered to Jesse Eisenberg's turn as Lex Luthor, whose maniacal liveliness reminded me more than a few times of Jim Carrey's Riddler, Terrio and Goyer's script struggles to dig any deeper into his villainous motivation against Superman, leaving the antagonist side of the film without a substantial purpose beyond megalomania. The discovery and exploitation of kryptonite, the shoddy levels of tech security for both billionaires and alien species, and the changeable limits of Superman's powers of awareness and damage containment -- among others -- stick out like sore thumbs as examples of "comic-book logic" for the sake of moving forward. It's tough to disguise these things with there being so much crammed into Snyder's two-and-a-half hour runtime, and it shows as the film plods along. Infused with a series of meandering dream sequences that revolve around Batman's fear of a world under the thumb of the Man of Steel, Dawn of Justice generates a bleak and bizarre tone leading up to the grand square-off purported by the title. The graininess and punchy contrast of Zack Snyder's visual style, equal parts Watchmen and Sucker Punch through the lens of Larry Fong, does play well into this foreboding atmosphere, as does the sharpness that Hans Zimmer's electric, operatic score adds to the austerity. And much like Man of Steel, slow-motion sequences are kept to a minimum, though the director cannot resist himself at certain points; yes, we get to relive the Wayne family murder once again, and those pearls come slowly tumbling down. 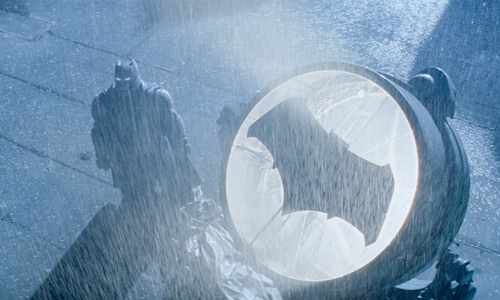 This starkness encompasses shots of a Superman statue spray-painted with "False God" and the shadowy corners of a sleek, revamped Batcave some distance away from an abandoned Wayne Manor, resulting in an almost other-worldly depiction of the DC universe, both stimulating to look at and too burdensome for the good of the story. Dawn of Justice seems comparatively light on action until a vigorous final act jacks things up, but not exactly due to the brawl everyone's been waiting for. Getting these two to fight one another, which ends up being a flip on "The Dark Knight Returns" in terms of who's hunting who, involves some remarkably convoluted circumstances, and the payoff -- especially how their battle reaches a ceasefire -- struggles to justify that expectation. Instead, Snyder and his writers incorporate another momentous story from the comics involving the spiny troll-looking monster Doomsday, which, unfortunately, feels tacked on at the end to give the early formation of DC's cinematic Justice League something no-holds-barred and violent to do ... though, that does include Gal Gadot's formidable arrival as Wonder Woman, one of the film's highlights. Snyder took on more than he could handle in Dawn of Justice, and what results is a bunch of bombastic moments with potential impact strewn together with a workmanlike narrative, driven more by ambition towards the dawn of a franchise than landing the right punches here.